I love the sun. I love it so much. I love being on a boat, I love being on a beach and I love being by a pool. But with everything we know about the sun and how damaging it can be to the skin, I find myself constantly wearing a hat, always wearing sunscreen and hiding under an umbrella as much as possible. Which means less tan skin…and that ain’t gonna work for me. Luckily, self tanners and spray tans have made staying tan weekly possible, all without the sun! But no matter if you’re getting a spray tan or using a tanner at home, the prep is the same! Exfoliation is everything. If you want an even color, be sure to exfoliate. And you can really use whatever exfoliant you prefer. I love this clean sugar scrub, but it leaves a film on the skin so you need sure to cleanse afterwards. So what I do is scrub my skin with the sugar scrub, then wash my skin with body wash with a loofa, shave and then wash my skin once more with a loofa. This removes any excess hair, dead skin and whatever other weird things my body has on it. If you are getting a spray tan, I’ve heard that showering 3-4 hours before a tan is best because your pores have time to close. I have no idea if that’s true. But be sure to notA put any lotion on before your tan – you want it clean as can be. If you’re putting on tanner at home, be sure to apply it with an application mitt. No need to have brown calluses like I’ve had in the past. Don’t be like me. 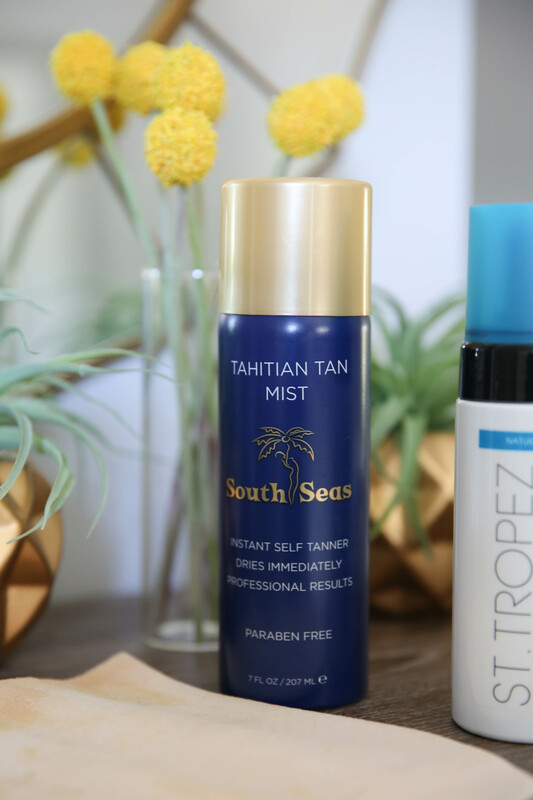 I’ve tried a ton of different tanners but my favorite so far that look the most natural include the St Tropez Tanning Mousse (for more natural color) or the St Tropez Self Tan Express Advanced Bronzing Mousse (for a darker color) and I like a top coat of South Seas Tahitian Tan Mist. 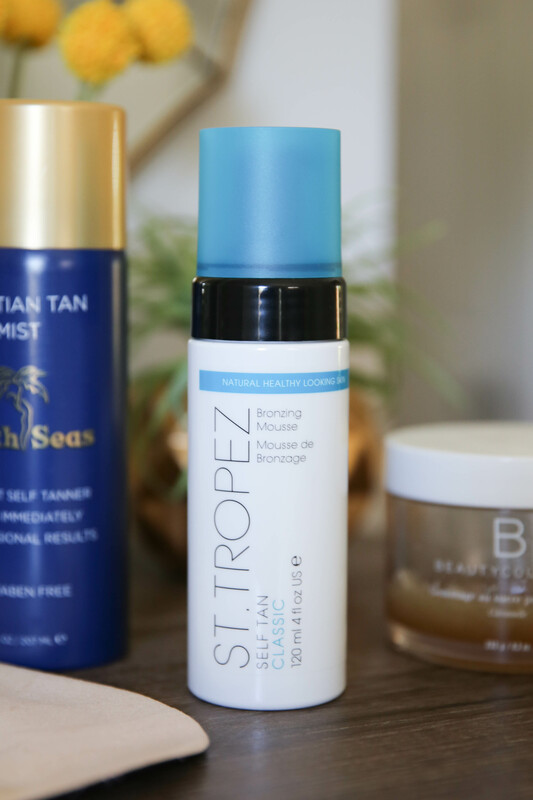 The St Tropez Tanning Mousse and the South Seas Tahitian Tan Mist together have been my favorite for getting the perfect color for my skin tone. If you’re going to a salon to get a spray tan, wear black, loose fitting clothes that are easy to get on when you are feeling sticky, like a black sleeveless dress. And if you think you’re white sheets are going to make it through your many tans in the future, leave that thought behind. I moved onto grey sheets because I couldn’t stand the brown stains looking back at me every time I pulled back the covers. After I put on tanner or get a spray tan, I try to keep it on as long as possible, even sleeping in it. I normally sleep wrapped in a blanket instead of my sheets that night so I don’t get any extra tanner on the sheets. I try to go 8-12 hours without showering. Then once I’m in the shower, I try to not use any product on my skin and if I do, it’s without a loofa and in cooler water. Now to keep your tan looking it’s best, you gotta keep your skin hydrated (especially if you live in a dry place like me!). I’ve liked using this lotion and it’s been amazing for my insanely dry skin, but I’ve found that an oil keeps that tan color longer. This glow shimmer oil keeps the skin hydrate and glowing! It’s really not too complicated – just exfoliate, hydrate and figure out if you like spray tans or tanning lotions for your own skin and life. But beware – spray tans and tanning lotions aren’t real tans, so if you’re wearing any tight-fitting clothes regularly, the tan will rub off. Whenever I’m trying to keep my color it’s best, I try to only wear my workout leggings when I’m working out and take them off immediately afterwards…which is hard for me since I live in leggings. But the leggings rub the tan off at my ankles and I have these weird tan kankles because of it. Not into it. So plan your outfits accordingly! I hope this helps your plan for any of your upcoming events you may have this summer! I’d love to hear what you’re into…spray tans or self tanners? And be sure to let me know what self tanners you’re loving so I can try those out if I haven’t already! Happy tanning! I wish I could resist the sun!!! I wear a hat, put sunscreen on my face and try to stay in the shade. I only care about my face and chest. I like getting a spray tan to get my whole body, for a trip or event. For everyday things like being able to wear skirts and shorts without blinding people lol, I’ve been using the St. Tropez and really like it but am going to look into adding this mist with it as well. I recently tried Josie Maran’s Argan Liquid Gold Self Tanning Oil and was really pleased with the results. It was easy to apply with the mitt, didn’t smell bad (in fact, the scent is actually nice) and the color was very natural looking. I feel like I really have a tan when I use it. i’ll look that one up! thanks for the recommendation! Julie, any tips on applying to one’s face? sadly no, i honestly don’t use tanner on my face since I use a face wash that includes an exfoliant in it. i just use lots of bronzer to match my skin color! I am exactly the same way – I love the sun but find I spend most of my time under an umbrella or a hat. I’ve been using a self-tanner called “Fake-n-Bake” at home for a while now. It’s alright, but I’ve been looking for something new. I’m excited to try the St. Tropez! Thanks for sharing! Have you ever tried tanceuticals self-tanner? i haven’t! i’ve never heard of it! LOVE self tanner! I haven’t had a spray tan in a while, but I started using the St. Tropez bronzing mousse when you posted about it a while back. I’m obsessed. It goes on so easily with the mitt, and it looks so natural. I’m going to try it with this mist soon as well! Thanks for the tip! isn’t it the best?! the mitt makes it so easy and it goes on so evenly! I love this Beauty by Earth Tanner! It smells great and has a nice natural color ! It lasts a fair amount of time too! I prefer spray tans though cuz I am lazy and don’t like trying to get all the spots haha. I use the self tanner just for my legs because my legs are always super white ! i’ll look that one up! I love St Tropez mousse! I also like to use Jergens Natural Glow daily moisturizer in between my self tanner! Love the blog- thanks for the tips! Julie! Love your blog and podcast! I have to know, how is Jackson doing? I hope he’s ok.
he’s doing great! as soon as I left the next morning, he slept in and was back to feeling like himself by the afternoon. so freaking weird. How precisely can self-tanner be applied? I wear the same style of tank top every day, as well leggings most days, and I do a lot of outside chores. I have a total farm-girl tan – when I get undressed my husband says “nice shirt!” because every from mid-chest/back up is deep tan, and the rest pasty white. I’ll be taking a beach vacation later this summer, and the effect in a suit is going to pass from comical to tragic. Is it possible to get the self tanner right up to the edges of an existing tan to help blend it in better? What kind of self tanner do you use on your face? Also the St Tropez? i honestly don’t use tanner on my face since I use a face wash that includes an exfoliant in it. i just use lots of bronzer to match my skin color! Hey Juli! Loved this post, I’m eager to try out these products! Question for you… do you apply the self tanner to your face? I’d like to use it on my entire body but am hesitant to for fear of breaking out. Thanks! 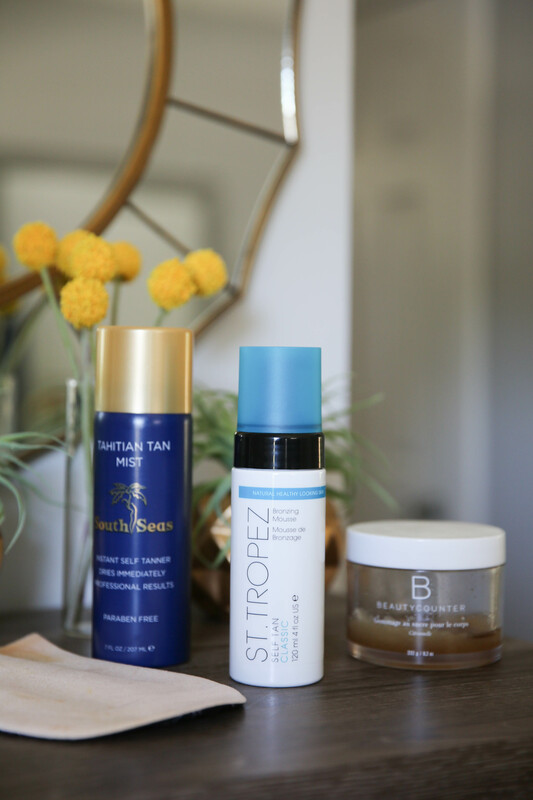 I have been using St. Tropez (both the classic and accelerated) for quite some time now, and am quite fond of the product. My prep routine includes exfoliating, but I can’t quite seem to master my ankles and the area around them. They always end up looking blotchy and unnatural. It looks even worst when it begins to wear off. Do you (or anyone else) have any tips. I do the same, apply in the evening, and after I shower the next day, I am golden (quite literally)! 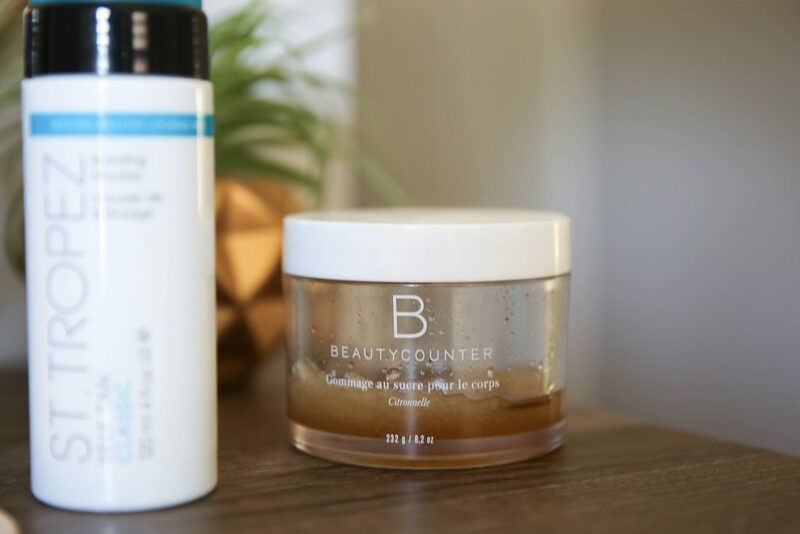 The Beautycounter scrub is my favorite! Smells so good! My favorite self tanner is Chocolate sun self tanning lotion. It’s organic, non-toxic and natural but absolutely works!! I started out using St. Tropez too but recently switched to this! the tanner is going to come off to some degree whenever you shower, shave, get in water or sweat. it’s just how it goes. i don’t have too big of an issue with that once i shower though! The Loving Tan brand is bomb – best stuff I’ve ever used! It has different undertones than St. Tropez, and looks really, really lovely and natural! Thanks for the tip on the body oil! FYI, for the back, amazon sells a tan applicator brush. It has a long handle and a sponge-like applicator. It’s better than having the white back. And for the face, I put a dab of st. Tropez mousse on a large, RealTechniques powder brush, and swirl the color from the center out, swirling, swirling until it looks even and feels dry. Works great. good to know!! thanks for the recommendation! Hi Juli! 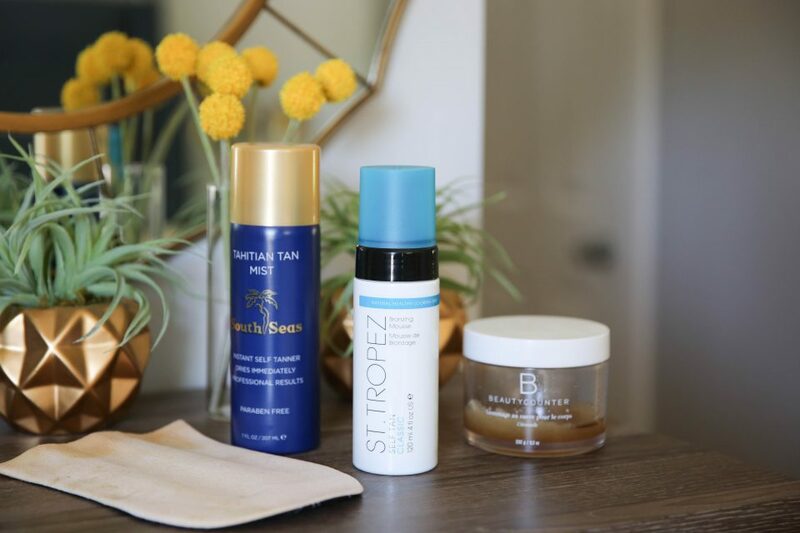 How often do you reapply the St Tropez tan? Hey Juli! I live in the Denver Area and am curious what Salon you go to for your spray tans? Would love to know some place you love and trust. PS, LOVE your blog. i go to Glamour Bar for spray tans! I’ve ordered my first self tanner and it should be here today. I was watching some tutorials and they talked about your dryer parts of your chin (knees, elbows, hands etc) and how you should apply some lotion there cause the tanner will stick to it harder. I am doing this for a trip to see a friend and he is super dark from tanning this summer and I don’t want to look like a ghost. But I don’t want to look like an orange either. I need all the help I can get! Thanks!